A curious collection of wild animals: dashing horses, stealthy wolves, leaping rabbits, peaceful birds, and more are all included in the diverse and unusual group of images portrayed in the next exhibit at the Gallery at 48 Natoma in Folsom. 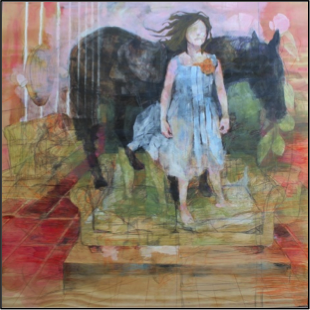 In the show, “Menagerie,” Mariam Pakbaz will exhibit her hauntingly beautiful mixed media drawing/paintings with wonderful ceramic figurative sculptures by Jeanette Morrow. Both artists play with the interaction of animals and the human figure to symbolically convey their thoughts. The exhibit opens March 20 and continues through May 7, 2015. The artwork by Mariam Pakbaz are reflections of what she refers to as the “unvisual unwindings” of the inner-workings of her mind. The young artist, recently out of graduate school, skillfully applies mixed media (acrylic, ink, watercolor, watercolor pencil and graphite) on large plywood panels capturing elusive images of beautifully rendered people and animals in almost dreamlike scenes. The finished pieces often show fluid transparent layers of sketching and overlapping figures that she refers to as flashes of imagery representing the changing nature of thoughts. “They are immaterial thoughts that are the unfocused puzzle pieces that make up a portion of my identity. A physical representation is produced from an autobiographical moment,” said Pakbaz about her work. Jeanette Morrow was originally intrigued with the mask form while studying Eskimo ceremonial masks in an art history class two decades ago. Even though these two artists have never shown their work together before, their harmonious colors and similar subjects portrayed in different media and dimensions seem destined to make a wonderful exhibit that is sure to be a favorite with gallery visitors. In the adjacent Community Gallery at 48 Natoma, a great display of students art from Folsom’s Vista Del Lago High School will feature work from the advanced painting classes taught by teacher Gayle Martin. The public is invited to celebrate both exhibits at the free opening reception on Friday, March 20, 2015 from 6:00 to 8:00 pm, with refreshments, wine and live jazz keyboard by Chet Chwalik. The Gallery at 48 Natoma is managed by the Folsom Parks and Recreation Department and showcases art by regional and national professional artists, area museum collections and traveling exhibitions; offering high quality original art exhibits to the community that may otherwise not be experienced in this area. The gallery is free and open to the public and art is available for purchase. Hours are Monday through Friday from 9-5, with additional hours Tuesday and Wednesday evenings from 6-8pm. Free tours can be arranged by appointment. For more information contact Cindy Abraham, (916) 355-7285, or cabraham@folsom.ca.us. Pingback: Tales of Lore: Darth Revan – The Rise | Masks of the World.